The last we heard from England's Change Of Heart was in 2005, better than 10 years ago. The promising AOR melodic rock formed by vocalist, guitarist, and principal songwriter Alan Clark makes a comeback with Last Tiger, released by Escape Music, the label that kick started the band's early career. If you have some recollection of the band's earlier material than you know Clark pens melodic hard rock tastefully bound in an AOR wrapper. The songs easily blend harmony, melody, and groove to rock with catchy radio-friendly accessibility. Yet, beyond Clark's methodical songwriting, I found the album to have two significant strengths. The first is his vocals and the harmonious vocal arrangements. It's something to note when the credits show that all the players are involved in the vocals. Clark has strong voice, and a natural clean rock presence. The second strength is the guitar presence. Nice harmonious riffs are emboldened by some very strong lead solos by Nick Catterick. Put all these elements together and Change Of Heart offer a very strong album. Some mention of the songs. It's a mixed bag, in the very best sense. Some straight rockers in Last Tiger, Rise to the Challenge, or Only Tomorrow. A few things come on stronger, a bit heavier and marching nearly like metal are March Of Souls and Stone Cold. Some of that AOR flavors rises in the anthems Roads Of My Life and Touch Your Soul. Again, Last Tiger is simply a strong offering of classic AOR melodic hard rock. After all, ten years in making, Clark had the time to polish these songs. Easily recommended. Sadly, I have no band picture nor a music video from the band to offer you. 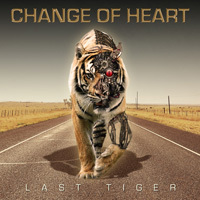 Change Of Heart's Last Tiger is simply a strong offering of classic AOR melodic hard rock. After all, ten years in making, Alan Clark had the time to polish these songs. Easily recommended.